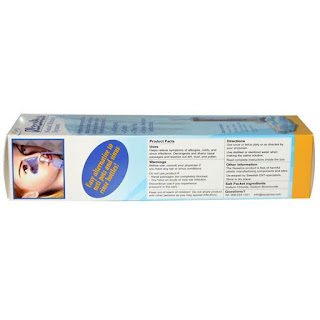 Nasaline is a drug-free nasal rinsing system designed by a team of Swedish ear, nose, and throat specialists.With the simple use of saline solution, Nasaline washes away unwanted mucous, crusty secretions or allergens. It provides relief from symptoms associated with sinus, allergies, colds, or the flu. 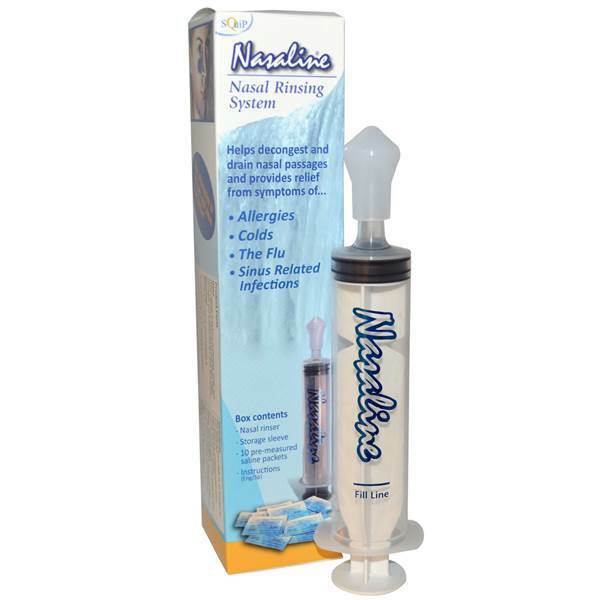 Nasaline nasal rinsing system is an easy, comfortable and effective method to rinse the nasal passages with saline solution. Syringe delivery system allows user to controls the flow and pressure of the saline solution for optimum comfort and effectiveness. Patented technology with silicone tip/applicator to allow for an easy and gentle rinsing experience. 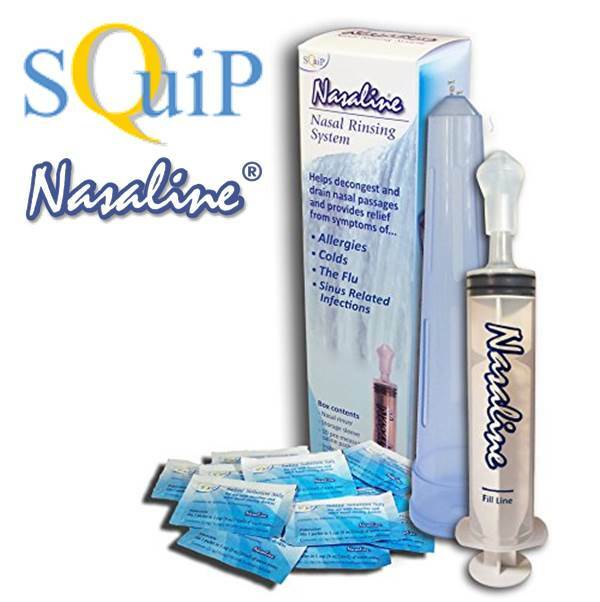 Nasaline is a patented nasal rinsing system that consists of a 2 oz. syringe, a silicone tip, saline and a storage/travel case. The silicone tip was designed to fit most noses in such a way as to completely seal the nostril opening. The channel inside the tip is formed in the shape of an hourglass, producing a gentle swirl stream when the saline solution enters the nose. The silicone tip does not contain latex and is safe for direct contact with the skin. Designed to produce a gentle and effective swirl when the saline solution enters the nose. 1. Mix 1 packet (1/2 teaspoon) of Nasaline salt into 1 cup (8 ounces) of warm distilled or sterilized water (ca 2.5 grams salt into 1/4 liter water). Stir to dissolve the salt. 2. Extract the saline solution into the Nasaline applicator. Nasaline - Nasal Irrigation System - Push saline solution into the nostrilNasaline - Nasal Irrigation System - Saline solution fills the nasal cavity. 3a. Stand (or sit) slightly bent over a bathroom sink, washbasin, or bathtub. Put the silicone tip against the nose so that it completely seals the nostril. Slowly push the saline solution up into the nostril. Breathe normally (or say aaah...) through the mouth and refrain from swallowing. 3b. When the saline solution reaches the back of the nasal cavity, the palate closes automatically by reflex. The saline solution fills the nasal cavity and proceeds to pour out of the other nostril as it brings along unwanted mucus and crusty secretions. 3c. Occasionally, some of the saline solution can trickle down the throat. This is not harmful. A proper flushing should take anywhere from 3-7 seconds per nostril depending on level of congestion, narrowness of ones nasal passages or personal preference. Repeat the process for the other nostril. 4. Use a tissue to gently blow out any remaining saline solution in the nose. Some of the saline solution can remain in the nose and trickle out a few hours later. Tilting your head forward and turning side to side immediately after flushing can prevent this. If you are severely congested, the saline solution can reach the sinus channels and can occasionally drip out of the eyes. This is not harmful and can be prevented by flushing more slowly. Use two(2) full syringes twice in each nostril per rinsing session. Rinse once or twice daily or as recommended by your doctor. Remove the tip, pull out the plunger and flush all 3 parts with warm water. The Nasaline applicator can also be cleaned with a mild dishwashing detergent. Dry all 3 parts. Once dry, keep the Nasaline unit stored with the plunger inserted into the cylinder to prevent the rubber surrounding the plunger from swelling. Can I use Nasaline if I am pregnant or breastfeeding? Nasaline can be used during pregnancy and breastfeeding. In fact, since pregnant women should not be taking drugs for pregnancy congestion, nasal irrigation with saline solution is considered one of the best healthy natural alternatives to many over the counter and prescription drugs. I've been using a Neti Pot for years, how is Nasaline different from the Neti Pot? With Nasaline, the user actually controls the amount of pressure used, depending on the level of congestion. 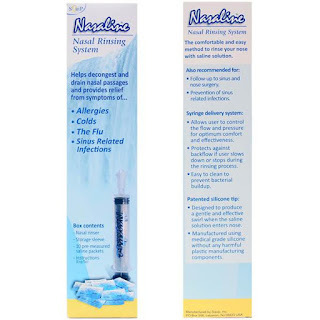 The patented silicon tip provides for a complete seal to the nostril, preventing any saline solution from pouring back through the same nostril for a more effective nasal rinse. Also, because you don't rely on gravity with Nasaline (as with a Neti Pot), you don't have to tilt your head awkwardly to the side, you simply stand upright, leaning slightly forward over your sink. Is the tip safe for contact with the skin? The ENTIRE Nasaline applicator is latex-free and completely safe as it was specifically designed for direct contact with the skin. You can use ordinary salt, but if you are planning to use Nasaline for an extended period of time, you should use salt that is non-iodized and free of preservatives or anti-caking agents – additives that have been known to produce allergic reactions. We recommend using Nasaline Salt, which is 99.99% purified and completely free of additives. What dosage should I use for Nasaline? How should I clean Nasaline? Where and how should I store Nasaline? Nasaline should be stored in a dry environment at room temperature. We recommend that you store the Nasaline applicator with the plunger inserted into the cylinder to prevent the rubber surrounding the plunger from swelling. Nasaline consists of a 2 oz. syringe and a silicone tip. Simply fill the Nasaline syringe with saline solution and experience drug-free relief from everyday nasal and sinus ailments.